This specially conditioned low lint, brushed knit cloth is of the highest quality microfiber cloth. It grabs onto & holds dust particles very well. This is our most versatile cloth. Uses include: computer screens - desktop, laptop, tablet, TV screens, monitors, camera bodies/accessories, office/lab equipment, game machines, personal electronics, glass polishing, Industrial critical cleaning and more. Cloth Size 8" x 12", 12" x 16", 16" x 16"
Shipping Weight each 8" x 12"
800 case pcs: 25 lb. 400 case pcs: 25 lbs. Notes Pre-conditioned to reduce lint. Ready to use right out of the pack. One of our most versatile cloths. Brushed Suede Microfiber Cloths are Fantastic!!!! I bought a bunch of these cloths to clean my glasses. They are so nice and so much larger than the cloths that the optician had. I highly recommend these to anyone who wears glasses. Thanks, Nicole! The suede cloths are also great for general cleaning -- mirrors, kitchens, car interiors. They wash great, too! We appreciate your taking the time to review these cloths for us! 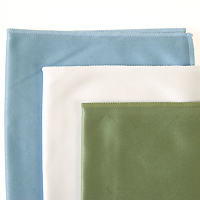 I purchased three different microfiber cloths, suede, diamond weave and silky woven. The different cloths are well presented with a useful instruction sheet. I have used the cloths to clean my camera lenses, my computer monitor screen and television screen without any problems. This cloth is great for everything. I use it after a shower to wipe down/clean the mirrors. I keep one in the car to clean the inside of the windshield and windows. Great either dry or keep a small spray bottle of distilled water to lightly spray. I can't think of anything that can't be cleaned better with this cloth. 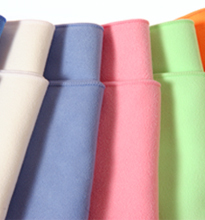 The thickness of the Brushed Suede Microfiber makes it great for many applications. Sturdy but still light in your hand and really grabs on to dust. I'm very happy with this product. The service was prompt and professional. Shipment was accurate and on time. Would recommend this company to anyone. I used this cloth on my LCD screen as recommended. It gave me the clean I would expect from a screen cloth. But to my surprise it did an outstanding job on the glass on my china cabinet too! Gives a streak free when paired up with the Photodon Ultra screen cleaner (also great on glass!) And there wasn't any lint left behind! I love this cloth so much that I'm buying one for each my mother, sister, daughters and best girlfriend since they too have glass furniture. I ordered the beige for myself but I'm getting pink for all of them. What a neat cloth! We screen print these and cut them in six pieces and insert them in our brochures. They are great. This cloth performs as advertised, good size, good price. I would recommend this product to a friend. i use this to put between my keyboard and screen of my mac book when I'm not using it. a great cloth for computer screens, iphone, ipads . Small size handy to carry with you.